Are you looking for the perfect gift? This Remote Control Quad copter is your best choice to bring you amazing fun and excitment for all ages. 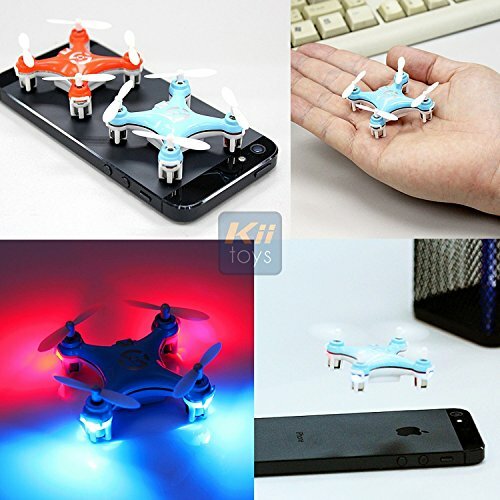 KiiToys introducing the World's smallest Quadcopter X-10! The most notable feature of this quadcopter is its nano size, with only 1.5 x 1.5 inch, it is yet the smallest quadcopter in the world! Adopting solid material and exquisite workmanship, it is safe and durable enough for anyone in all age to play. It is very easy to control with the game pad style radio controller. The remote control equiped with 2.4Ghz which gives you a long range and stable control over your quadcopter with no interference. The 6 axis gyro system equiped on the quadcopter will provide you an extreme stable flight and also enable you "Throw to Fly" - to throw the quadcopter in the air to start the flight! It will bring you lots of surprise and fun in flight, and will keep you entertained all the time. Don't hesitate to bring such a good remote control toy home today. 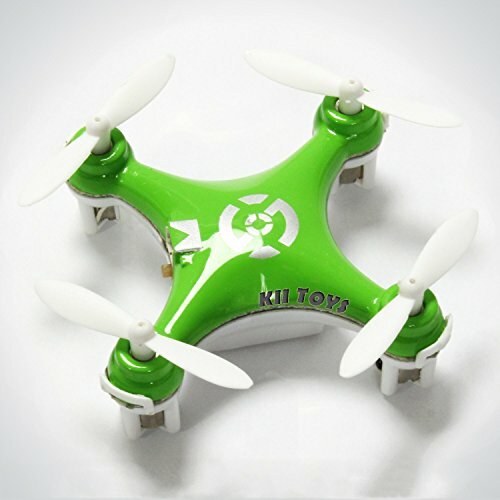 Available in 5 color: White, Green, Blue, Orange and Pink, collect all 5 colors to have a quadcopter party! 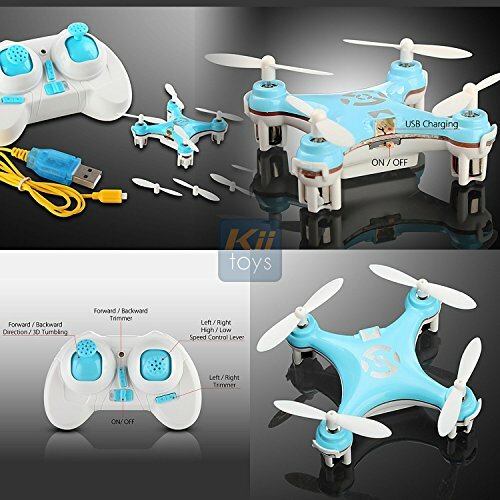 NANO SIZE - KiiToys X-10 is the Smallest Quadcopter in the world, size 1.5 x 1.5 inch (4cm x 4 cm), 5-8 mins Flight time with a single charge. 2.4Ghz Remote Control Toys 4CH 6 Axis RC Quadcopter RC Helicopters STABLE FLIGHT - 6-axis design makes the gyroscope adjustable, promoting flying stability; Full Movement: Ascend/Descend, Forward/Backward, Left/Right Rotation, Left/Right Drifting, Hovering. 3D fliping stunt tumbling action EASY TO FLY - Quad copter strong motor fast moving works indoor, LED light indicates front and back of the heli and also great for low light flying and light show, 4-channel 2.4GHz with fine tunning which can fly multiple Quadcopters at the same time! BUILT TO LAST - Precision built with strong material to withhold impact and increase durability. Powered by a piece of rechargeable 3.7V 100mAh lithium battery. Charge with USB cable. LOTS OF FUN! - Four micor motor with super stong uplift power giving you hyper movement. 4 CH channel 6 Axis Gyroscope R/C RTF UFO Drone. Replacement rotors also availble. 3-level adjustable speed flip function, perform in Air stunt show with amazing LED lights!